Brown & Brown, Inc. (BRO) and its subsidiaries, provides insurance and reinsurance products and services, as well as risk management, employee benefit administration and managed health care services. It is a diversified insurance agency and brokerage firm, markets and sells to its customer’s insurance products and services, primarily in the property and casualty area. BRO has operations in 219 locations and in 37 states. BRO is member of Mergent’s Dividend Achiever Index and S&P Mid-Cap 400 Index. The most recent dividend increase was in October 2009. Here I am looking at trends for past 10 years of company’s revenue and profitability. These parameters should show consistently growth trends. The trend charts and data summary are shown in images below. Revenue: In general, a growing trend since 2000. The average revenue growth for last 10 years has been approximately 13.8%. 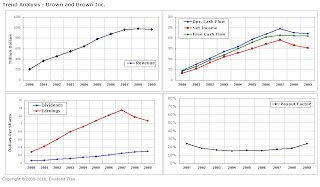 Cash Flows: Overall, until 2008, a growing trend of free cash flow and operating cash flow. FCF is consistently more than net income. EPS from continuing operation: In general, it had an increasing trend until 2007, drop in 2008, and flat in 2009. Dividends per share: Very slow anemic albeit growing trend. Here I use the corporation’s financial health to assign a risk number for measuring risk-to-dividends. The risk number for risk-to-dividends is 1.57. This is a low risk category as per my 3-point risk scale. Dividend growth rate: The average dividend growth of 18.9% (stdev. 4.81%) is more than average EPS growth rate of 12.3% (stdev. 14.5%). Duration of dividend growth: 16 years of consecutive dividends growth. Payout factor: It has been less than 30% since 2001. The range of fair value is calculated as $18.2 to $21.2. BRO is a 70 year old company, and is in top 10 independent insurance intermediaries in US. Its growth model consists of growing market share by acquisition of insurance agencies. Its revenue is pretty much focused in US markets; with approx 70% of revenue is concentrated in 9 states. It continues to have very stable gross and operating margins. It continues to generate relatively stable free cash flows. Keeping with the downturn and financial service/insurance industry, BRO is also experiencing slow down. However, it is still profitable and has consistent cash flows. The risk factor is that other than acquisition mode of growth model, there is not other source of growth. 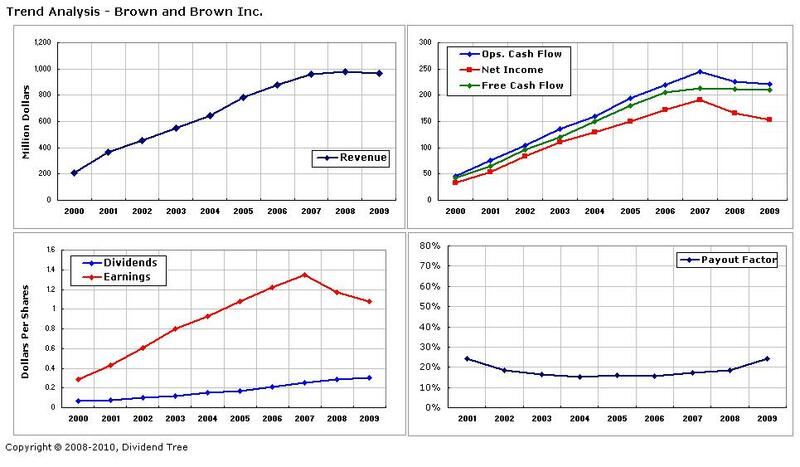 Brown and Brown Inc is stable and slow growth mid-cap company. It is expected to continue to have a sustainable cash flow over next few years. It is typical dividend growth company where dividends grow in excess of 10%. However, the dividends yields are less than 2%. The stock’s current risk-to-dividend rating is 1.57 (low risk). The current pricing of $19.8 is within my buy range. I would be open to initiating a position based my allocation levels. Full Disclosure: No position at the time of this writing. I may buy in near future.